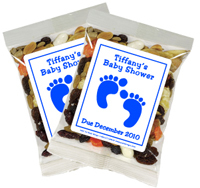 Our personalized products make a perfect Baby Shower Favor. Moms and Dads-to-be will love seeing their unborn baby's name on a custom personalized product. We can match your baby shower theme by using any color, graphic, or sonogram photo. This treat doubles as a wonderful keepsake for party guests too! Some our favors include edible sweets, mint favors, beverage favors, peel and stick labels and more. 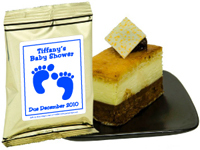 Baby Shower candy bar wrappers, Baby Shower Tic Tac mints, Baby Shower bookmarkers, and Baby Shower popcorn wrapper favors are among our most popular Baby Shower favors. 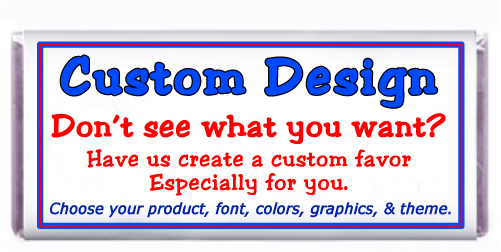 Party Wraps baby shower favor designs, can be personalized and used as a party favor or gift. Our party favors and gifts are a perfect way to celebrate your baby shower celebration.